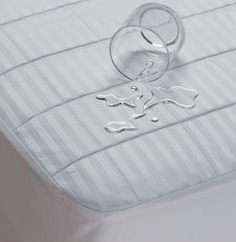 Sateen Cotton Waterproof Mattress Pads are super absorbent with a 100% cotton top. With this Mattress pad you get FOUR layers of protection as shown in the diagram above. The top layer is made of cotton, underneathe is a poly/rayon soaker layer, the fourth layer is waterproof vinyl and the final layer is a non-woven protective back that insures zero liquid penetration! You sleep on comfortable high thread count cotton sheets....why would you want anything less for your mattress pad. Our Sateen Cotton pad combines the luxury of sateen with the protection of a fully waterproof fitted mattress pad.